Windjammer is a black pinto son of Cyclone owned by Mike Pryor. 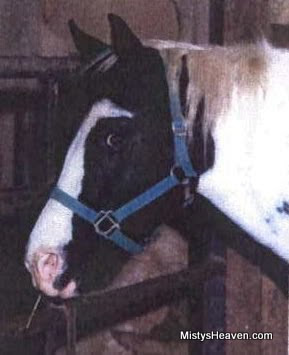 His mother was a black pinto Paint Horse mare on the farm at the time. TripleAction Penny is also the dam of Chemina Mist and a colt that was nicknamed "Junior". Windjammer was used as a stallion by Pryor and sired two known foals, Night Storm and Nightmist. It's possible he sired other foals. Nightmist is out of Windjammer's granddam Windy, was put into Windy's pasture as a companion to the old mare and ended up breeding with her. Windjammer died several years after Nightmist was born.